Succeeded as King of Macedon with his father Philip II in 336 BC, recognised by the Greek cities as strategist pantocrator, he initiated the expedition against Persia and tore to Darius III his empire. Chasing the dream of universal empire, went so far as to extremes eastern borders of the known world, but had to abandon the company when his men refused to follow him any further. Back in the West, died suddenly in Babylon in 323 BC, perhaps as a result of an attack of Ague. All the exploits of Alexander the great were gigantic and the grandeur of his victories were strongly impressed in the fantasies of the people, insomuch that his figure seized the popular legends of Persia and India and his memory, after many centuries, survives in those distant regions. Since ancient times figure and victories of the great king were covered by idealized portrayals from artists and writers. The tradition remembers that the portraits were executed by order of the same ruler by the sculptor Lysippos, the painter Apelles and Pirgotele (the only authorized engraver by Alexander to effigiarlo on gems), in which is already evident the tendency to an iconography that introduces Alexander as a hero, a ruler inspired by divinity. So, in the images of Alexander the great with the Eagle, the aegis (the mythical shield of Zeus), the lightning is easy to see a parallel with the father of the gods. Medieval depictions of the legendary Alexander's Ascension into heaven, taken from a novel of the century III AC, can be interpreted as a proof of the divinity of the ruler. In the literary field, there are numerous medieval works in which Alexander appears as an example of the perfect Knight. So idealized, the actual historical role of Alexander the great is often difficult to define in all of its actions. 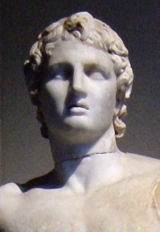 Some modern critics, following the reviews of the ancients, have regarded Alexander as one of the great figures of history and have exalted the figure and enterprises; others have tried to lower her personality closer to that of other characters with remarkable intelligence and favored by fortune. Today we can no longer properly discern what in the work of Alexander the great is his individual design and what must be recognised to his warriors and officials. It is a fact, however, that Alexander the great in just a decade, from 334 to 323 BC, was able to bring together the most different political structures and to centralize all elements in his personality, such as Greek, Macedonian and Asian. His history is a continuous flow of dominant actions that maybe achieved very different results from what expected. From 334 until his return to Babylon, Alexander found himself faced with new and increasingly complex problems and knew how to fix them with his strategic skills, tactics and politics. After the conquest, the target was to create a new politcal form all based on the reconstruction: the ancient problem of relations between Greece, Macedonia and Asia rejected him with the same intensity with which he was presented at the beginning of the great expedition, but material and moral conditions changed very much in that decade. In Babylon, when Greek and Macedonian ambassadors were in town for the official visit, Alexander found himself for the first time faced with the results of his conquest. He had heard that they cannot be exclusively nor Greek, neither Macedonian nor Asian and not being able to close in a defined formula; a single principle would indeed removed the others. The premature death did not allow him to start actually his reconstruction policy, and we cannot guess the stages through which it passed, nor to presume battles and what would still have achieved as triumphs. Alexander remains however one of the greatest figures in history, the symbol of a great wolrdwide moment. Darius III arised to the Persian throne in 335 BC after a bloody series of Palace's conspiracies that followed the death by poisoning of Artaxerxes III. Was repeatedly Defeated by Alexander the great at Issus and Gaugamela. Despite the glaring loss, Darius, however, refused to give up and Alexander pursued him North to Ecbatana, capital of Media, then to the current Tehran and finally further East. During this retreat, Darius was taken prisoner by his vassal, the satrap of Bactria, and was murdered at the very moment when he was about to fall into the hands of Alexander. His last defenders were taken one by one after a series of extremely difficult military actions, that saw falling countless soldiers. For thirty years the Greek poleis had fought the Peloponnesian War (431-362 BC) and all of them were broken and vulnerable, even Sparta and Athens where now turned into decline. From their weakness took advantage the small northern Kingdom of Macedonia whose throne sits Philip II Argèade. Warned by the violent speeches of Demosthenes from Athens, which thundered against the arrogance of Philip, the Greek poleis shook then Hellenic League, that was however beaten in 338 BC at Chaeronea, in Boeotia, from Macedonians: from Thessaly to the Peloponnese, Greece was under the power of Philip II who, for appeasement and the reordering of the country, promoted a Panhellenic League, a League of all Greeks. He himself took the command and set out as a guideline in the struggle against Persia, the eternal foe since the days of Marathon and Salamis. The Panhellenic army was virtually running, and some avant-garde artists were already in Asia minor, when an obscure Palace intrigue made pass the Crown on the head of Prince Alexander, that the Hellenes immediately called Alexander the great. The young King, who was raised in the Greek spirit by his teacher Aristotle, continued his father's policy and in 334 BC, having quelled a series of rebellions against his rule in Greece, moved against the Persian Empire, where at the throne sat the great King Darius III. The Roman mosaic depicting Alexander the great and Darius from the House of Faun in Pompeii. The hot summer of 333 BC drew now at the end when, the Panhellenic army led by Alexander the great, reached Cilicia in Southeastern Anatolia, with the intention of forcing mountain accesses to Syria to strike the heart of the Persian Empire. King from just one year, the young Macedon had taken over his father's dream to take what he considers a "Trojan war" against Darius III, the great King of the Persians. In the midst of the Hellespont he sacrificed a bull to Poseidon, God of the sea, and, once landed in Asia, wanted to climb up to Troy to pay homage to Athena Iliad. Then, sure of its value, and the favour of the gods, it was reckless against the satraps of Asia minor, vassals of the great King, and had seized the key points of the Anatolian peninsula. From the Greek cities of the coast he was greeted as a liberator. But what now the young leader was preparing to do was daring and dangerous because he left behind a lot enemy troops still in arms and the entire Persian fleet intact. The Hellenistic period opens with the reforms of the doctrines and the regulations of classical age, introduced by Alexander the great, based on the experience of the century that was passed from the Peloponnesian War to the one against his Kingdom. The Macedonian phalanx had, first of all, a lightening of the various parts of its weapons Kit, a smaller and much lighter shield and also a lighter pike even if longer than the previous model. The deployment of the infantry in battle order continued to be in the rigid phalanx system that was used since the reform introduced by Philip II on the basis of the study and experiences of Epaminondas. The Macedonian phalanx was characterized by several new factors: sarisa, usually called sarissa, a long pike of approximately 4.30 meters; the depth of the deployment that had reached the 16 lines (the first line man who commanded the entire row retained the rank of decadarca, suggesting that the original line up was on depth of 10 and 16 lines); the greater flexibility of the Phalanx, determined by the introduction in the middle of the deployment of some lines of light infantrymen and archers and infantry divisions of the phalangitic mass in units equivalent to regiments, the taxeis, 1500 men each, in turn subdivided into locoi (companies); the increased security, thanks to the protection of the sides and the back of the grid obtained by using tactics of cavalry, infantry and, if necessary, special troops (archers and Slingers). With this new system had been remedied some of the serious problems that prevented the ancient Hoplite phalanx to be use in combat in open, flat and vast expanded fields. However, very serious drawbacks remained. Faced with a frontal attack, the Macedonian phalanx was terrible for the pikes that protruded on his forehead, were deadly for the approaching enemy. However every conversion still be highly problematic, considering the difficulty to move on themselves for the men armed so cumbersome, especially since on the sides and on the back they could not deploy chosen warriors as the pezetairoi (infantry with too heavy armour). On the other hand, to ensure a greater possibility of manoeuvre, taxeis were kept separate among them, but, in this way, between one and other units were left corridors, useful for the maneuver, but also served by the enemy to infiltrate and stop holding the alignment. The typical attack line of the Macedonian phalanx: first the psiloi (1), lightly armed in the forefront; just behind them the Phalanx (2), as shown above, with the Hoplites, armed with the long sarissa, arranged in 16 lines (the first lines have the spear in the down position for the attack); Peltast rear (3) with a short spear; flanking Cavalry (4). During this period was also inaugurated a new kind of heavy infantry put in regular use by Macedonians composed by the Hypaspistai, or ipaspisti. They had a shield similar to the Peltast one; the small round or pelta form of zither, and their armament, the helmet, breastplate, and famous sarisa did not differ substantially from that of the pezetairoi, the phalangitic Hoplites, but it was a chosen body with particular prowess, intended to strengthen and drag the normal infantry line of the Phalanx. With this reinforcement of chosen troops, the Macedonian phalanx remained, with Alexander and his successors, the base that allowed the wide use of light infantry and cavalry. These units conscious of the help that could have from the infantry units that, even if not decisive for the victories as centuries before, made them possible, guaranteeing a maximum tactic safety coefficient. 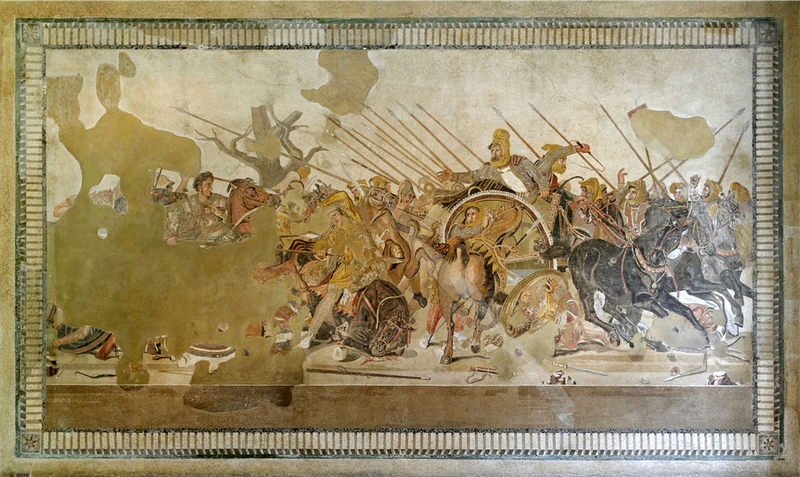 In some battles of Alexander the great, heavy infantry, under his leadership, had important parts, as happened at Issus in 333; generally, however, these were cases in which he was very close to be defeated for the extreme difficulty to control his heavy troops, heavy troops that were useful only if deployed in a very tight formation. The evolution of Greek art of war of IV cen. have saw the continuous growth of importance of cavalry and light infantry, which already was shaping up at the end of the previous century, while heavy infantry moves to a sort of support function. Alessandro adapted, even better than his father, the new ordinances to the needs of the war in vast stretches of plains, opposing the supple and daring action of light infantry even to cavalry and chariots, hitting horses or unsaddle knights and topple the chariots. Archers and slingers, along with light infantry and their javelin, were often able to decide fights. Alexander had light infantrymen and archers who were the authors of the victory as Gaugamela, where they managed to break the impact of persian war chariots. In these new developments in the art of war, in command as in the ranks were required men not only equipped with muscles, courage and good faith, but warriors of certain techniques, mistress in the use of their weapons, as could be procured only from professional troops. The triumph of mercenaries was, therefore, also a consequence of the new military techniques, as much as it was a consequence of a new economic and social course where it was no longer possible to "distract" citizens from their business for send them to fight, while was far more advantageous to hire others who fought instead of the same citizens and with greater technique and effectiveness. With Alexander, and after him, cavalry and light infantry decided the wars; but during the 3rd century almost every army had excellent cavalries, that neutralising each other, leaving the phalangitic infantries to face off as in the ancient era. Alexander the great had the cavalry in the proportion of 1 to 2 compared to heavy infantry, but during the 3rd century, it went down again until the ratio of 1 to 8, becoming more usual when the enemy was the Roman army, weak in cavalry but with a massive infantry. The golden period of Hellenistic cavalry was much shorter than a century, and was closely associated with the best time of use of the archers, slingers, and light infantry. Alexander developed this units using Cavalry in all possible ways, i.e. Vanguard (exploration, fighting ailment, opposing cavalries); supporting and complementary action (which could become decisive) on the sides and on the back of the infantry line; in frontal attack to penetrate and upset the enemy. Among this three cavalry purpouses, the third was the newest and the favorite by Alexander, so the cavalry became the decisive force in the battles. Alexander had various Cavalry specialties including the normal traditional cavalrymen and then others who used a short spear, the xyston, that were opposed to the Persian cavalry armed with short swords and javelins. The latter type of cavalry had then Hellenistic armies specialities, presenting cavalries armed only with Javelin or Javelin and sword. The horse archers were ever widely used in Hellenistic armies as in the Iranian countries. There was also the Cataphract Cavalry, consisting in armored Knights and horses, and arming the knight with the sarisa; this was the last speciality of Armored Cavalry before Middle Ages, Lancers, unassailable by infantry, but inevitably no escape when dismounted. Even Cataphract cavalry equipement was copied by the Asians, and divisions differed when armored with metal plate or defended with iron mesh cooked. This knights mainly fighted with their long spears and counted on an element not always easy to obtain largely: horses with constitution enough robust to march and charge while carrying an armour and, of course, a heavily armored man. Larger horses were needed, and they are obtained by crossing the great nesei horses, of Asian origin, with Libyan horses, achieving remarkable specimens with strength muscle and great proportions without falling into a variety only adapt for heavy work. The army that Alexander had brought in Asia was the result of a long evolution of the Hellenic military art and largely dates back to the military reforms of his father Philip. The core of the Army consisted in Pezetairoi infantry, mostly Macedonians, that carrying a Pike up to six metres long, the famous sarissa, were composing the Phalanx. Unlike the Greek, Macedonians were known as horse breeders from immemorial time, they had developed a strong component of heavy cavalry, especially elite units of Hetairoi (companions) and various departments of infantry and light cavalry, often not Greek, that were representing the exploratory mobility part of the whole army. The Macedonian army is deployed on the field divided into three main parts: on the right wing there was heavy cavalry, Hetairoi included, the light cavalry was on the left wing composed mainly by Macedonians, Thessalians or Greek mercenaries; in the Center there was the Phalanx. Usually, the Phalanx was flanked by "Hypaspistoi ton hetairon" units, which had the task of defending its vulnerable flanks. In the early stages of the movement major formations were preceded by light infantry consisting of slingers, archers and javelin throwers. The study of the battles fought by the Macedonian army shows a tactical scheme that can be termed as "hammer and anvil". The battle was opened by a determined attack of hetairoi heavy cavalry against the enemy's left flank, while the light cavalry assumed a defensive stance by extending the front to prevent possible circumvention. Thereupon the Phalanx moved against the enemy and advancing to right in declining. When the pressure of the Phalanx was growing, the heavy cavalry operated a conversion to the left becoming the hammer which crushed the enemy on the anvil represented by the phalangitic line, fraught with pikes. 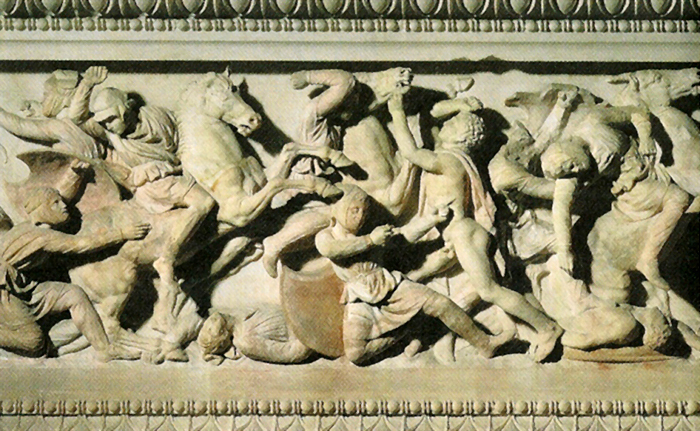 Sarcophagus frieze depicting the battle. The Persian army was a true international army which brought together numerous mercenaries of Greek descent who fought with the traditional hoplitic method. The Hellenic phalanx hired by the Persians was usually in the center of the grid flanked by the multitudes of light infantry Eastern army. Cavalries, far more efficient, were consisted of heavy units and mounted archers, without any kind of protection. The Persian heavy cavalry was in part similar to that which inspired Macedonian and formed the mainstay of the army of Darius. The Persian heavy Knight was protected by a mesh armour or iron plates, on which he wore a wide woven or embroidered tunic brightly-colored. It is uncertain whether under the hat, the knight bring a helmet or a iron or bronze protection. The offensive armament consisted of two javelins, or a spear (xiston) and a Javelin; in close combat the Persian Knight mainly used a short curved sword. There aren't historical sources that report the use of a shield among this warriors. While Alexander marched along the narrow coastal strip of southern Beilan Cilicia, "the door of Syria", the army of 600,000 men setted up by Darius III in the Eastern satrapies encamped near the city of Sochi, which would later become Antioch. To cut contacts between the Greeks in march and the temporary base that they had established in the small port of Issus, the Persian army had made a countermarch on its left flank pouncing on the seaside town massacring many wounded who had found refuge in it. Alexander was not intimidated nor for the number of enemies niether for the danger to remain cut off from the coast, so he went back on his walk to the river Pinaro, where, on the right bank, had deployed the Persians. The battlefield was the plain between the sea and the mountains, wide, in that point, just a mile and a half. Both armies found themselves in the weird situation of having their communications line crossed out from the opposite side. Alexander's army strong of 40,000 men, was where the coastline just grew and dispose in fighting order according to a well-tested tactical scheme. The cavalry took position on the wings of the grid: at right the Macedonian Hetairoi were commanded by Alexander, at the left Greek and Tessalians with the General Parmenion. The infantry line, disposed at the Centre, consisted of two Hypaspistai units commanded by Nicanor, and phalanx units led by Ceno, Melangro, Ptolemy, Perdiccas and Amyntas, the faithful generals that shared enterprises and the glory of Alexander. On the extreme left were the Greek mercenary troops and Cretan archers. At the last moment, a line of infantry, supported by two groups of cavalry, was sent to the mountain to protect the right flank of the line and to try to encircle the Persian left. The Persian army had assumed a defensive position, protected by the steep banks of the river Pinaro with further work of fortified embankments and Palisades. The 25,000 mercenaries Hoplites, which constituted the center of the grid, were joined on either side by the 100,000 oriental infantrymen; on the right flank, nearby the sea, manoeuvred 50,000 Knights, while a dismounted contingent had been sent to the left to try an enveloping movement. Because of limited space on the battlefield, a few thousand men who made up the rest of Asian army was relegated behind the frontlines, staggered in depth. 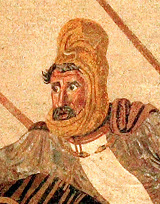 Darius had taken position at the center of the army. While the Macedonian phalanx began to advance towards the enemy Centre, Alexander's cavalry crossed the river and attacked on the persian left, tha was unable to withstand the impact. The charge, however, led too far the Hetairoi who lost contact with their own Center. In the passage created by this action, wedged the Greek mercenaries, hired by the Persians, but the Phalanx was able to align and the Macedonian Centre, which received the Persian impact, was able to contain the attack. Alexander, reorganized his cavalry, lashed out against the flank of the Greek mercenaries who were forced to abandon the position along the River, while the Phalanx started to advance by exerciting heavy pressure on the Persian Centre. Meanwhile, on the sea side, the open terrain favored the Persian cavalry that launched the attack against Tessalians and Greek commanded by Parmenion, who had to withdraw to prepare for a last stand. But the battle was decided in the middle. Under the repeated attacks of the Alexander's Cavalry and pressed by the Phalanx, the Greek mercenaries hired by Darius ceded, causing the general route of the Persian infantry massed behind them: in few minutes, tens thousands men, who still had not even fought, withdrew in great disorder. Among them also Darius, the great King, found refuge in the escape. Seeing the army routed the Persian Cavalry, which on the seaside was beating the Macedonian left wing, quickly abandoned the camp and so was involved in the disaster. The battle was virtually over, but the massacre had just begun. The Macedonian cavalry threw itself in pursuit of the Persians, 100,000 of whom, according to the Greek sources, remained on the field, while Macedonian losses were probably just over 1,000 men; among the prisoners there was also the imperial family that Darius had abandoned by fleeing. 17.32 Alexander known that Darius was just a few days, then sent Parmenion to check Syria's doors. Darius sent his baggage to Damascus. Alexander captured Issus. 17.33 When Scouts reported that Dario was only at 30 stages and was moving ahead with the whole army in battle formation, Alexander realized that this was an opportunity to "destroy the Persian power in a single victory". He send light troops just in front of the Phalanx and took the command of the right wing with the best of his mounted troops. Tessalian cavalry was on the left. In a first moment there was an exchange of darts between two formations, then the trumpets played the attack and the two armies were in contact. 17.34 the strategy of Alexander and his companions was to attack the great King, and this they did. Officers from all over fought well. There were many deaths and many injured. Alexander was wounded in the thigh. When the horses of the great King, terrified by the battle, threatened to flinged him, Darius boarded on another wagon. At this point, Darius was seized by terror and fled with several of his men. Also much of the cavalry began to flee to the cities looking for refuge. 17.35 So the Macedonians turned towards the Persian camp where they took a lot of gold. Also many Persian women were taken. 17.36 It was pitiful to see these women of noble birth, being led away as slaves. Particularly pitiful was the family of Darius, his mother, his wife, two daughters-age husband and a child of six years. The royal pages prepared the tent of Darius and prepared everything so that he [Alexander] when returned from the pursuit could take properties of Darius as some kind of bid for the conquest of Asia. Escaping, Darius was still alive, but the defeat at Issus had left open to the Macedonians the way for Syria and Phoenicia, and had also given a mortal blow to the reputation of invincibility on its territory of the Persian army. Byblos and Sidon were immediately subjected and saved, but the superb Tyrus, who wanted to resist, was destroyed after a siege of seven months. In 332 BC the Macedonian tore the Egypt to the Persian rule and the priests of Hammon-Ra recognised him as Pharaoh giving divine honors. On the Nile he founded the city of Alexandria, the first of many baptized with its name. Returned to Syria in 331 BC, Alexander defeated Darius again at Gaugamela, the "camel grazing" on the upper Tigris River; then, while the great King was escaping again, he triumphantly reached the Imperial capital: Persepolis. The city was burnt down with all its treasures. At Ecbatana, the summer capital, Darius III was murdered in 330 BC by the satrap Bessus, who gave himself the title of King under the name of Artaxerxes IV, but Alexander, who considered himself as the heir to the new Persian dynasty, pursued him eastward to the river Osso (Amu Darja), then captured and crucified him in 329 BC. He conquered the Kingdom of Parthia and Sogdiana, where married Princess Ròssane, in 327 BC, and then advanced into unknown territories corresponding to today's Afghanistan, Uzbekistan and Tajikistan. Although he was now 5,000 miles from Pella and 3,000 from Babylon, Alexander continued to advance towards the Valley of the Indus, pushing the limits never before achieved by no other conqueror. In Punjab fighted with Poro, rajah of Lahore, and defeated him on the river Hydaspes (Jhelum). At this point his men refused to proceed over to avoid being swallowed up by the "Ocean sea" that marked the boundary of the known lands. The adventurous trip in the west, by sea and by land, ended at Susa in 324 BC; a year after the great Alexander died in Babylon while preparing a new expedition to Arabia. He was 33 years old and had reigned for 13.